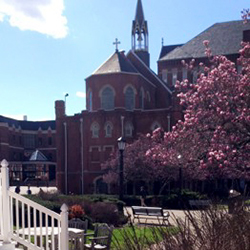 Question: What's the Duquesne University campus like? 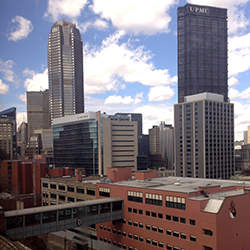 Erin Hayden: Duquesne's unique campus not only allows you to develop as a student on a enclosed campus but also as a growing professional within a downtown area. There are many job opportunities available downtown, or in the surrounding area with ample transportation methods for those without cars. Living downtown has some spectacular perks, including the views! Despite all there is downtown, some of the best views and perks can be found right on our very own campus. A view of downtown on a beautiful day while studying in the private study rooms within Gumberg Library is hard to beat. You can check out a private study room for 4 hours at a time. They're great for group study or if you need a quiet place to study yourself. Mellon Hall is one of the science buildings on campus. It houses two lecture halls and the biology, biochemistry, chemistry and pharmacy professor offices. It also houses the biology, chemistry and pharmacy laboratories. The side of the building overlooks McCloskey Field while the back of the building looks out over the river into Southside. This picture was taken on a snowy morning from the study area outside of the pharmacy laboratories. 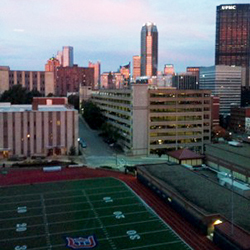 Duquesne offers many different housing types on campus for students. This picture was taken from a lounge in Des Places, the newest building on campus. 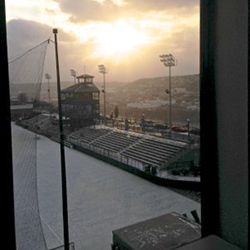 It overlooks Rooney Field, the practice field, and has a great view of downtown. This building was also built eco-friendly. It includes Britta filter water bottle stations, recycling on each floor, elevators that generate electricity as they brake, and even solar panels! When in Pittsburgh, do as the "Yinzers" do. 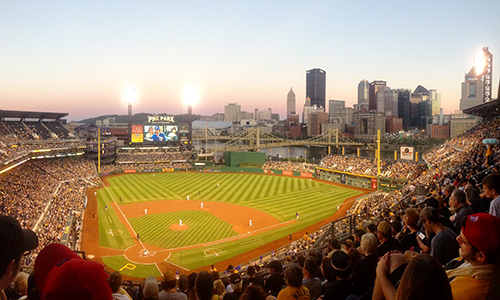 There is ton to do in Pittsburgh, but one of the most original is to go see a Pirates game at PNC Park. Duquesne provides discounted tickets to all their students (especially on free t- shirt or hat night!). If you're considering coming to Pittsburgh, be prepared for the snow! There's always opportunity for winter time fun. 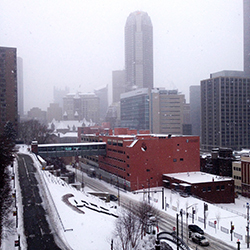 Tickets for skiing, ice skating and even snowshoeing are offered at great rates through Duquesne. Finally, if you're looking for a peaceful area to enjoy a nice spring day, there is a private courtyard behind the "Old Main" Administration building. It's hard to believe this picture was taken in the middle of a downtown area!